Today was a beautiful day in Ohio. The sky was bright, the sun shone down with friendly rays, and it was unseasonably warm. Looking longingly out the window from the conference room of an office building, I was reminded of grade school and those fabulous days when you convinced your teacher to hold class outside. It usually happened on the first warm day of spring. You would walk into your classroom through a landscape reeking of grass and growth, with flowers starting to bloom and birds chirping. One of the kids in the class would raise the possibility with the teacher, and then other kids would join in. Soon the pleas would build to a crescendo: “Please, Miss Tibbles? Please??? 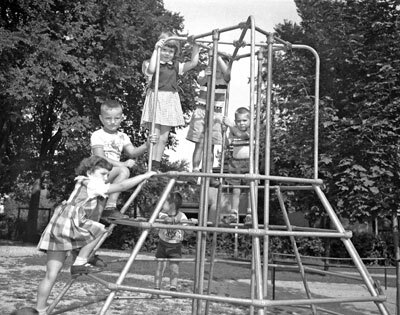 We promise we’ll be good!” And then the teacher, who probably was dealing with a touch of spring fever herself, would relent, and we would go outside and sit on the asphalt of the playground to listen to the day’s lessons. And, because we appreciated the gesture and didn’t want to get our nice teacher into trouble, we actually would try to be good. I always had a soft spot for teachers who agreed to hold class outside. Although I didn’t realize it at the time, it showed some real flexibility — and real confidence in their ability to control their class. And when it happened, it made those rare spring days that much more special. Who doesn’t look back fondly on the days when they got to have class outside? According to the latest Quinnipiac poll, Ohio’s Issue 2 — the issue that addresses collective bargaining and pension and health care benefits for public employees, among other matters — will get trounced at the polls. Nevertheless, we are still getting blitzed by fliers and ads about Issue 2, so the campaigns apparently still think the outcome is in doubt. According to the school website, Ms. Richardson teaches Spanish at the Continental Middle School. Continental is a small town in rural northwest Ohio. Its website says it is a “very stable community” made up principally of farm families “with excellent work ethics.” It has a population of about 1,100. Given these circumstances, how often do you think Ms. Richardson, or any Continental teacher, has had to engage in hard-fought negotiations about class size or safe classrooms? 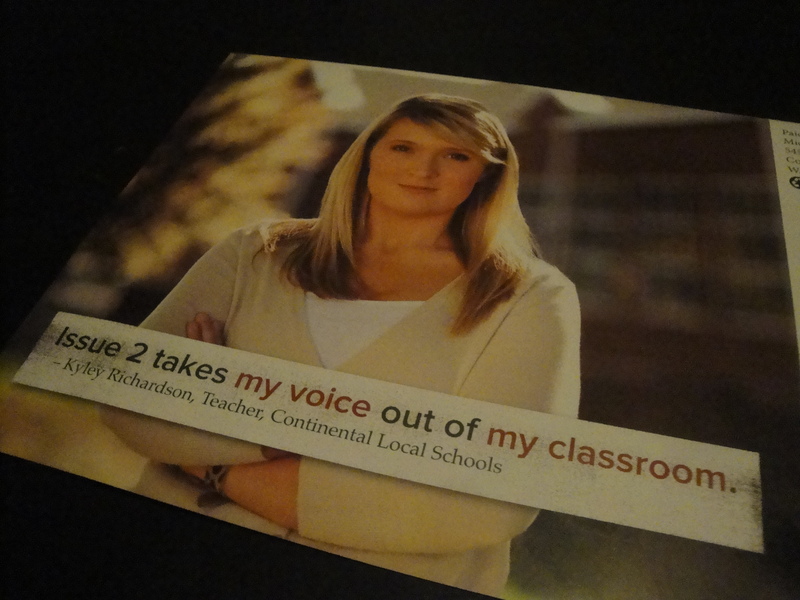 And if Issue 2 passed, do we really think that Ms. Richardson would be “silenced” — or do we think she could go to the next Board of Education meeting and they would listen respectfully to whatever she might say about “textbooks,” “standardized tests,” and “teacher layoffs”? With all due respect, Ms. Richardson’s views about what Issue 2 “could” do don’t have a lot of credibility with me. I remain convinced that most public employees oppose the measure because they know it will affect their pay and benefits, and not because of these other issues. Why don’t they just come out and say it? If, like me, you were schooled in the proper use of the written word by a stern, ruler-wielding English teacher who applied her red editing pen with liberal glee, it’s been a tough few years. The advent of email and texting and Twitter have stretched the old rules for written communications past the breaking point. If my old teachers read some of what passes for writing on those new media, they would loosen their hair buns, put their heads down on their well-worn copies of Strunk & White’s The Elements of Style, and weep bitter tears. Consider the exclamation point. We were taught that the exclamation point was a form of punctuation to be used rarely, if at all. It might, potentially, be useful to highlight an expression of surprise or a forceful statement, but mostly it was dismissed as a crutch for a poor writer who couldn’t drum up excitement with the story itself. When I got to journalism school, our acerbic, chain-smoking faculty advisor instructed that exclamation points were never used in a news story. But now, exclamation points are ridiculously common. If you look at your recently received texts or emails, you’ll likely see dozens of exclamation points — sometimes even double or triple exclamation points (as well as emoticons, made-up-on-the-spot abbreviations, and other recent linguistic developments). In fact, at times not using an exclamation point can be interpreted as rude or sarcastic. You can’t just say “Thanks.” It has to be “Thanks!” or maybe even “Thanks! !” — or you’re viewed as a surly jerk who isn’t sufficiently appreciative. For a guy in his 50s, the trick is to avoid sounding like an over-excited teenager (“OMG!!! !”) while at the same time not inadvertently giving offense because you adhere to outdated strictures that used to govern the King’s English. Where’s the rulebook? For now, I’ll loosen my use of the exclamation point — but I’m drawing the line at emoticons or substituting numbers or single letters for words! President Obama was in Columbus recently to tout his “jobs bill,” which would spend large amounts of federal money for teacher jobs and school building repairs. According to the United Federation of Teachers — which, not surprisingly, supports the idea — the President’s proposal would spend $35 billion to preserve teacher jobs and another $25 billion fixing schools. Why is it always teachers who benefit from these bills? A lot of lawyers have lost their jobs recently — how about a costly federal program to spur the hiring of more briefcase-totin’, lawbook-quotin’ attorneys, so they can realize the American Dream? Journalists also could use a hand. Many newspapers have gone under or radically cut their staffs because nobody reads news the old-fashioned way anymore. Or what about accountants? Sure, they’re boring, and perhaps the recession just served as an excuse for companies to unload deadly dull bean-counters because nobody could stand to share a table with them in the cafeteria, but they could use our help, too. So could insurance salesmen, and tugboat operators, and lumberjacks, and milkmen. Perhaps President Obama justs walks into the West Wing every morning whistling Crosby, Stills, Nash & Young’s Teach Your Children. Or maybe he’s heard the taunt about teachers that goes “those who can’t do, teach” and believes that our erstwhile educators won’t be able to find work if they lose their teaching gig. Don’t get me wrong. I like teachers — but there’s no reason why they should be favored over everybody else. What about stimulus spending and jobs bills for every profession, craft, and trade? It’s become the American Way! From Atlanta comes a deeply disturbing story about a massive cheating scandal to achieve higher scores on standardized tests. In this instance, however, the cheaters weren’t students — they were teachers, principals, and administrators. In Georgia, as in many other states, student and teacher performance is measured by scores on a standardized test. In this instance, the test is called the Criterion-Referenced Competency Test. In recent years, Atlanta schools reported increases in scores on the test, winning accolades for the Atlanta school district and its superintendent, who was named “U.S. Superintendent of the Year” in 2009. Now investigators have unearthed evidence of a massive conspiracy in which teachers, principals, and administrators not only changed answers to achieve better scores, but also worked actively to cover up the cheating. The report by the Georgia Bureau of Investigation names 178 teachers and administrators who participated — 82 of whom have confessed to their misdeeds — in a scandal that took place at 44 different schools. According to the Christian Science Monitor article linked above, reports of teacher cheating have been increasingly commonplace across America. Atlanta’s scholastic scandal is just the largest example of a growing problem. Educational advocates say the reports show that standardized testing is not a panacea, because tying school district funding and individual teacher compensation to higher scores just provides an incentive to cheat. So, they recommend that school districts implement much more involved auditing of the completed standardized tests. The Atlanta scandal is a black eye for the many dedicated and selfless teachers in America, and it raises a very basic, troubling question for public school parents across the country: What kind of people are teaching my kids? We are learning a lot about a changing America, and a changing political landscape, from watching the ongoing story in Wisconsin about legislation that would affect collective bargaining rules for public employees. The story began with public employee unions flexing their muscle. They prevailed upon their members — many of whom apparently called in “sick” — to flood the state capitol in protest. They also prevailed upon Democratic state senators to flee the state and bring the legislative process to a halt due to lack of a quorum. But then something surprising happened. Yesterday, a counter-demonstration occurred, as thousands of “Tea Party” activists and other citizens came to the state capitol to support Wisconsin’s Republican Governor in his budget-cutting efforts. In all, police estimated that 68,000 people came to the state capitol to either support or oppose the collective bargaining bill, and they did so peacefully. Even more interesting, police report that there were heated arguments between the opposing sides, but no violence. It is not surprising that teachers and public employees would turn out to protest; their pay and benefits will be directly affected by the outcome. What I think is extraordinary, however, is that thousands of citizens whose interests are not directly affected were motivated to spend a Saturday outside, advocating in support of the budget-cutting efforts of Wisconsin’s governor. It says a lot about the deep level of alarm about out-of-control spending that thousands of people would spend their precious weekend hours at a counter-protest. Wisconsin’s governor, and his Republican allies in the state legislature, must have been encouraged by the strong show of support — which probably is the tip of a much larger iceberg. It also says something that thousands of people could turn out to support competing sides of a hotly debated issue without violence. The teachers, public employees, and citizens who went to the state capitol to exercise their rights to free speech and assembly look a lot more adult than the Wisconsin Democratic Senators who turned tail and ran out of state rather than participate in the political process as they were elected to do.